"I never felt like I could belong to one culture or one identity, no matter how much I try. It's part of who I am"
Sherpa was born to a family of artists in Kathmandu, where it is traditional for parents to pass down their crafts to the next generation. 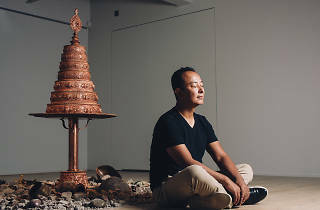 From the age of 13, Sherpa has studied and practiced traditional Tibetan art, so it was a natural progression for him to pursue a career as an artist – although he did dally with Buddhist philosophy, computer science and Mandarin as a student in Taiwan. Known for blending Tibetan art and thangka – a form of painting usually featuring Buddhist deities – Sherpa’s style is a culmination of his experiences and interactions with different cultures. “I still draw a lot from the traditional motifs and combine them with my own everyday life experience in the States,” he says. “It’s always interesting to see how they complement and don’t complement each other.” While Shepra keeps the spirit of thangka alive throughout his work, he also reinterprets and reinvents Tibetan, Nepalese and Buddhist iconography, dialing up the colour intensity to create his signature vibrant style. Following the earthquake in 2015, Sherpa returned to Nepal to see the damage caused by the natural disaster. “I saw both chaos and beauty at the same time,” Sherpa recalls. “Some of the landmarks I grew up with were destroyed and dilapidated. It was almost nightmare-ish.” For Sherpa, working on his new series became a therapeutic experience. Beautiful Decay is a reflection of how the earthquake has affected the people of Nepal and how the country is beautiful in its resilience. Held at Rossi & Rossi, the show’s centerpiece is a five-feet-tall copper tower with a base surrounded by broken pieces of brick and seemingly random objects. Titled Wish Fulfilling Tree, the tower is comprised of several circular levels with intrinsic patterns and faces sculpted around its circumference. Each level is filled with paper currency from Nepal, on which Sherpa asked survivors of the earthquake to write down their wishes. 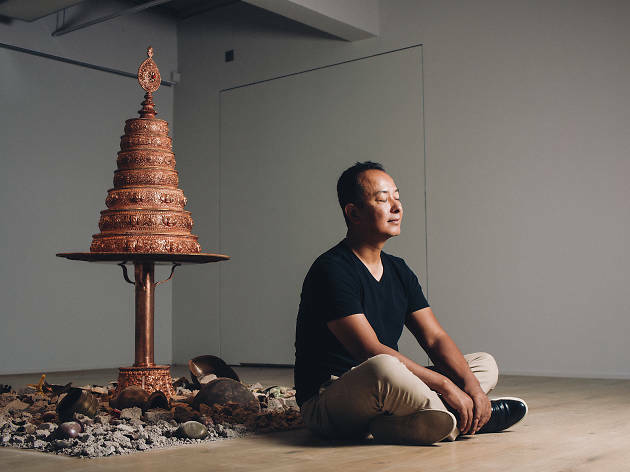 “The installation is an idea taken from traditional statues in Nepal,” Sherpa explains. “Historically, people stuff prayers in statues instead of wishes.” Taking a closer look at the tower, Sherpa’s injections of childlike humour are noticeable. Some of the faces on display wear comical smiles with hands holding up peace signs. Recreating the aftermath of the earthquake, the objects on the ground are pieces Sherpa collected from people who were affected and had lost their homes. The pieces range from a child’s hairclip to lipsticks, lunchboxes and a baking tray. The resulting scene is both unsettling and powerful. Sherpa has also created two installations, each comprised of 16 panels, that further explore the displacement of people and culture. Taking a traditional thangka image, Sherpa then fragments and rearranges it into separate pieces. “The fragments can’t be pieced back together,” says Sherpa. “It’s like when something is broken down, you can’t piece it back together the way it was.” The exhibition also features several paintings with metallic gold backgrounds. The use of gold leaf is a commentary on gold’s dichotomy − its presence in icons of spirituality and commercialism − while the use of swirls echoes the progression of displacement, a dissolving effect.